jetPEI®-HUVEC is a powerful transfection reagent optimized for the transfection of primary human endothelial cells such as HUVEC (Human umbilical vein endothelial cells). Transfection efficiencies up to 50% have been reached with this reagent. jetPEI®-HUVEC is also recommended for the transfection of vascular endothelial cells of various origins and appears to be well-suited for such fragile primary cells. 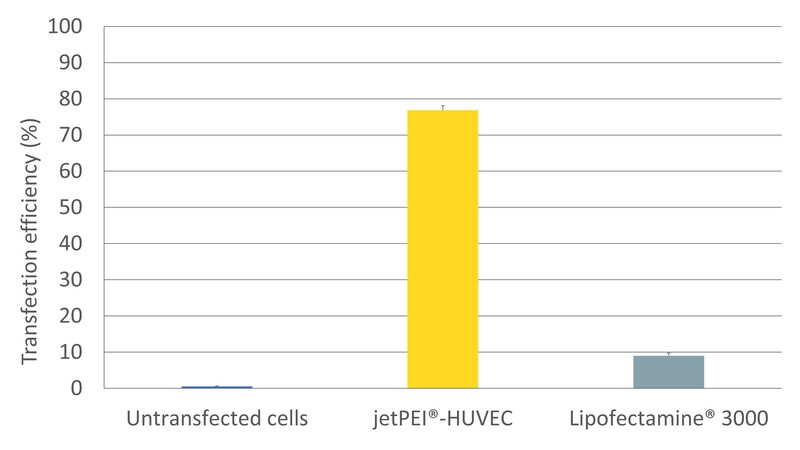 Compared to Lipofectamine® 3000, our standard and versatile transfection reagent, jetPEI®-HUVEC provides significantly higher transfection efficiencies in HUVEC cells (Fig. 1). Fig. 1: Higher transfection efficiency in HUVEC cells using jetPEI®-HUVEC versus its main competitor. HUVEC cells were transfected following the manufacturer’s recommendation using plasmid DNA encoding eGFP with jetPEI®-HUVEC or Lipofectamine® 3000. FACS analysis was performed 24 h post-transfection. 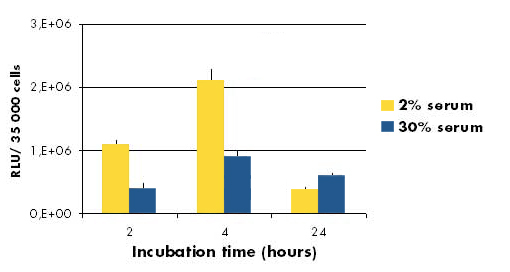 The effect of serum concentration and incubation time on transfection efficiency was analyzed (Fig. 2). Fig. 2: Effect of low (2 %) versus high (30 %) serum concentrations on transfection efficiency of jetPEI®-HUVEC. HUVEC cells were transfected for 2, 4 or 24 h with 2 µg of pCMVLuc plasmid DNA and 4 µl of jetPEI®-HUVEC in 24-well plates. Luciferase activity was measured 24 h after transfection. 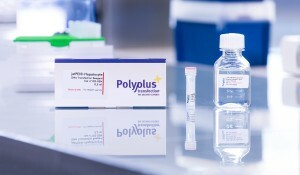 Transfection experiments performed in low (2 %) or high (30 %) concentrations of serum have shown that jetPEI®-HUVEC is most efficient when the cells are grown in low serum concentrations. Gene expression reaches a maximum for HUVEC after 4 h incubation with DNA/jetPEI®-HUVEC complexes. jetPEI®-HUVEC compares particularly favorably to other non-viral transfection reagents whether cationic lipids or polyamine (Fig. 3). 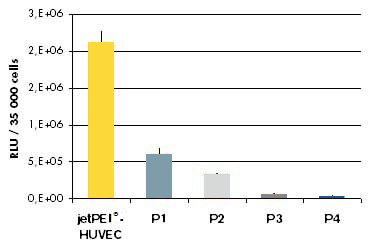 Figure 3: Comparison of transfection efficiency of jetPEI®-HUVEC and other commercially available reagents (P1-P4). Cells were transfected using optimal conditions established for each reagent. The jetPEI®-HUVEC protocol is as simple as the jetPEI® one: Mix the DNA with the reagent to form complexes and simply add the mixture to the cells. 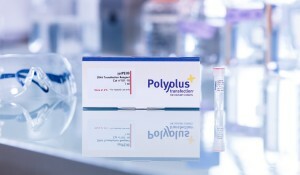 jetPEI®-HUVEC is compatible with serum and antibiotics, thus eliminating the need for media change. Protein expression is determined 24 h to 72 h post-transfection. jetPEI®-HUVEC is perfectly suited for plasmid delivery (DNA, shRNA or miRNA plasmids) to fragile cells, such as primary endothelial cells. Here is a selection of relevant references using jetPEI-HUVEC, more are available in our Polyplus-transfection Database. Feng, J., Zhang, Y., Xing, D. (2012). Low-power laser irradiation (LPLI) promotes VEGF expression and vascular endothelial cell proliferation through the activation of ERK/Sp1 pathway., Cell Signal 24, 1116. Ganguly, A., Yang, H., Zhang, H., Cabral, F., Patel, K. D. (2013). Microtubule dynamics control tail retraction in migrating vascular endothelial cells., Mol Cancer Ther 12, 2837. Jin, H. G., Yamashita, H., Nagano, Y., Fukuba, H., Hiji, M., Ohtsuki, T., Takahashi, T., Kohriyama, T., Kaibuchi, K., Matsumoto, M. (2006). Hypoxia-induced upregulation of endothelial small G protein RhoA and Rho-kinase/ROCK2 inhibits eNOS expression., Neurosci Lett408, 62-7. Wen, H. C., Kao, C., Hsu, R. C., Huo, Y. N., Ting, P. C., Chen, L. C., Hsu, S. P., Juan, S. H., Lee, W. S. (2013). Thy-1-induced migration inhibition in vascular endothelial cells through reducing the RhoA activity., PLoS ONE 8, e6150. Cristofaro, B., Stone, O. A., Caporali, A., Dawbarn, D., Ieronimakis, N., Reyes, M., Madeddu, P., Bates, D. O., Emanueli, C. (2010). Neurotrophin-3 is a novel angiogenic factor capable of therapeutic neovascularization in a mouse model of limb ischemia., Arterioscler Thromb Vasc Biol30, 1143. 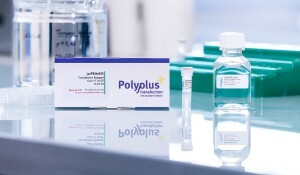 Every batch of jetPEI®-HUVEC is tested in a transfection assay. Typically, transfection of a firefly luciferase gene under the control of the CMV promoter gives 109 RLU (relative light unit)/mg of protein. The value for each batch is indicated on the Certificate of Analysis.